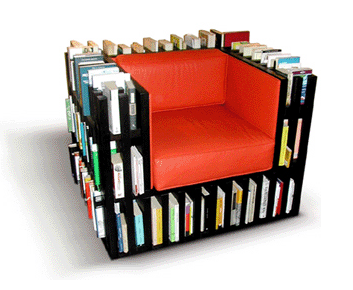 It’s a chair and a bookshelf in one! And it comes in lots of different color combos, including my favorite: orange armchair with chocolate brown bookshelves. Mmmmmm, pretty. Entry filed under: hi... i'm random. Tags: books, random, reading, wishlist. Oh my goodness! I want that, too! What a fantastic way to save a little space and knock two pieces of furniture out with one. That is awesome! I want one!!! this is so awesome. i want one!